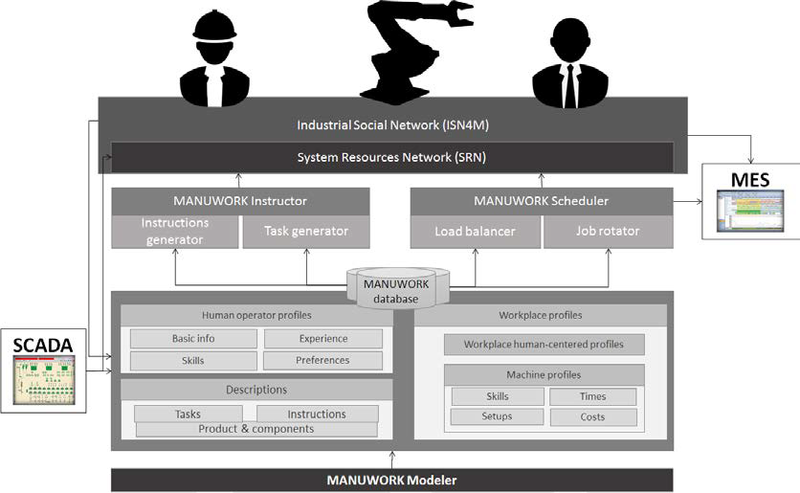 The MANUWORK project’s vision will be realised through integrated applications that will handle data and information from human operators and machines and at the same time provide new balanced lines based on the feedback received. In the following figure the main components are presented. Special attention will be given in the management of information coming from operators as well as data recorded passively (i.e. through wearable devices). In order to achieve a pre-specified level of confidentiality based on the respect to the operators’ privacy, special models will be adapted in real-time, avoiding the storage of raw data regarding the participants’ vital signs or performance. This will be used to create models of physical and psychological fatigue factors of the different workplaces and tasks.